ROCK, REVOLUTION AND ROMANCE: Jan (Michael Pinsky, left), a Czech philosophy student and rock music maven turned political activist, and Esme (Sarah Cuneo), daughter of a Cambridge Marxist philosophy professor, share an intense moment in Theatre Intimes production of Tom Stoppards Rock n Roll (2006), playing through November 19 at the Hamilton Murray Theater on the Princeton University campus. In fifteen short scenes moving back and forth from the Cambridge, England home of Marxist philosophy professor Max (Joseph Labatt) to the Prague apartment of Jan (Michael Pinsky) and other Prague locations, Rock n Roll is a play about philosophy and about Jans political and moral evolution. Semi-autobiographical, the play explores, through Jan, what Stoppard, born in Czechoslovakia and educated in England, might have done had he returned to his homeland to participate in the resistance to Soviet occupation in the late 1960s, 1970s and 80s. It is also a play about the human spirit and about human beings struggling to live their lives with integrity in the pursuit of understanding, compassion, and love. And most significantly, perhaps, this play is about the power of rock music to assert the spirit of freedom, individuality, and humanity in the face of all conflicting forces. That rock music is embodied here in the plays pervasive soundtrack, segments of more than 20 numbers from the likes of Syd Barrett, Bob Dylan, The Doors, Pink Floyd, the Rolling Stones the Beach Boys, the Beatles, the Velvet Underground, and the Czech band the Plastic People of the Universe, a powerful political force in the Velvet Revolution. The undergraduate Theatre Intime Company, directed by Princeton Junior Julia Bumke, meets the daunting challenges of all this intellectual, political, and emotional heft with significant success. Its a highly talented and sophisticated group and their production is impressive. The eleven-member ensemble is capable, consistently self-assured and in character, making notable character stretches as the figures in the play mature from early adulthood in act one to middle age in act two (or, for Max, into his old age). The multiple scenes transition swiftly, with brief rock music interludes and dates lit up on the side walls. Clear, simple delineation of Prague settings stage right, and Cambridge settings stage left, keep the audience apprised of the progress of plot and characters. Excellent program notes, including a brief historical timeline, along with a detailed list of scenes and soundtrack, are also helpful. Diction, projection, and expression here are mostly strong, engaging, and clear. Performers and production crew are uniformly well rehearsed and effective. the characters timeless interactions speak for themselves  but without that background knowledge there may be many confusing moments. Last Thursdays opening at Intime was my second encounter with Rock n Roll. I saw the Broadway version of the London production four years ago, and I do have some knowledge of rock music and Czech history 1968-1990. Still  and this is Mr. Stoppards problem, as well as Theatre Intimes  reading the play is a much more rich and moving experience than seeing it on stage. New York Times Theater critic Ben Brantley described Rock n Roll as triumphantly sentimental, and the timeless human interactions mentioned by Ms. Bumke are indeed the most important parts of the play, but the whirlwind of multiple plots, including so much personal, political, and intellectual content, cross-cutting back and forth across the stage as the fifteen scenes follow rapidly one after another, makes it difficult for the audience to become involved with the characters, to feel the depths of their passions and pains. Rock n Roll focuses on the stories of the two male protagonists, as their contrasting lives and philosophies develop over the years. Mr. Pinskys youthful Jan is thoroughly sympathetic. He charts his course through the Marxist politics of his Cambridge mentor, and then leaves England to plunge into the politics of Prague. He is never far from his beloved record albums, and he finds that his affinities for rock music set him even more intensely on his course of dangerous rebellion against the Communist regime and in support of Havel and the controversial music of the Plastic People of the Universe. Mr. Labatt as Max, with beard and stocky stature to his advantage, makes a worthy, convincing character stretch in playing the older intellectual, fighting hard for his beliefs, but also suffering as he sees his wife taken over by cancer in the first act and later in the play faces the diminishing powers of his own old age. 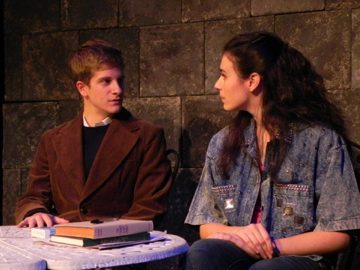 Sarah Paton as his dying wife Eleanor, a classics professor, and Sarah Cuneo as his daughter Esme, a teenager in act one, then the key character in the plays resolution in act two, are both excellent  appealing, impassioned, and articulate in voicing their needs and desires. Phil Rosen as the politically outspoken and persuasive Prague intellectual and dissident Ferdinand (partly based on Vaclav Havel), Juliet Garrett as Esmes strong-willed daughter Alice, a prospective Cambridge student in act two, Lindsey Rose Aguero-Sinclair as an alluring, politically and romantically savvy philology student at Cambridge in act one and a teacher in act two, all deliver focused, high energy, effective performances. Supporting actors Collin Stedman, Amy Gopinathan, Brandon Bark, and Jake Jackson, each in multiple roles, all contribute valuably to the proceedings, despite Ms. Gopinathans Czech accent causing occasional lapses in clarity. Christina Henricks simple, functional two-location set, lighting by Daniel Rattner helping to set and re-set the rapidly shifting scenes with precision and economy, and Kerry Brodies costumes enhance both characterization and background in creating the world of Rock n Roll. Tom Stoppards Rock n Roll is a great political/philosophical play and, at least in its written form, potentially a great human play too, though it does seem less easily accessible than many other justly acclaimed Stoppard works. This powerful, young Intime Company has chosen a worthy, formidable challenge and has brought Rock n Roll to life in a spirited, dramatically skilled production. Rock n Roll (2006) runs for one more weekend, Thursday through Saturday, November 17-19, at the Hamilton Murray Theater on the Princeton University campus, with performances at 8 p.m. Thursday and Friday and at 2 p.m. and 8 p.m. on Saturday. For information call (609) 258-1742 or visit www.princeton.edu/utickets.